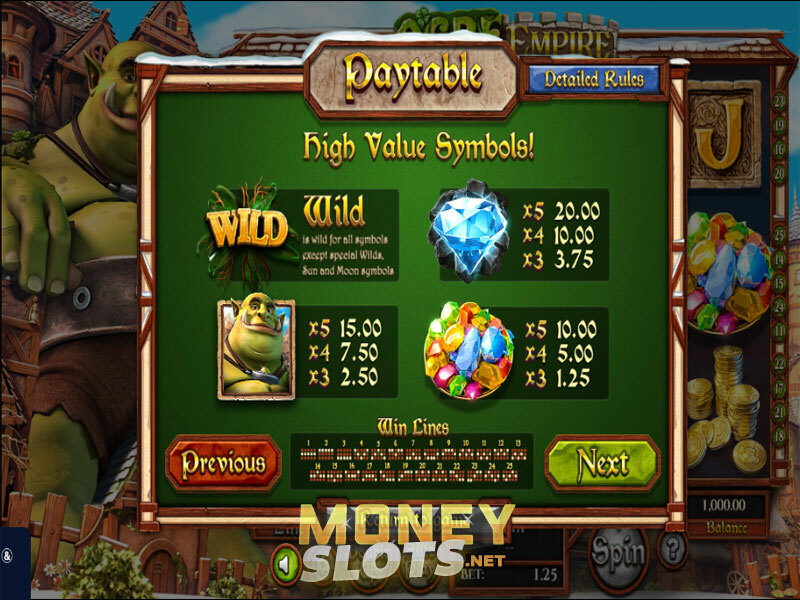 Ogre Empire is a fantasy-themed 3D video slot with captivating graphics depicting a magical kingdom and a soundtrack synchronized with every spin. Betsoft released the fairytale-themed 5-reel slot with 25 fixed paylines in 2018. In this kingdom, the green Ogre hunts the citizens and smashes the reels with his giant club during the day. All the life is happening during the night when the beast is asleep. The Sun and the Moon symbols, which act as Scatters, activate the Day and Night modes. You can benefit from both modes since each has its unique features. The Day mode can award Sun Bloom Wild Flower or Daytime Ogre Smash. On the other hand, the Night mode replaces J, Q and K symbols with Joker Wild, Queen and King. Additionally, there is a Night Bloom Wild Flower in this mode. Standard symbols of the game are Gold Coins, Ogre’s Club, Mushroom and stone playing cards from Jacks through Aces while high-value symbols are Wild, which substitutes for all regular symbols, the Ogre himself, diamonds and plates of jewels. The game starts in the Day mode. Capture the Moon symbol completely on the third reel to shift the game to Night mode. Stop the Sun on the third reel as well to return to the Day mode. 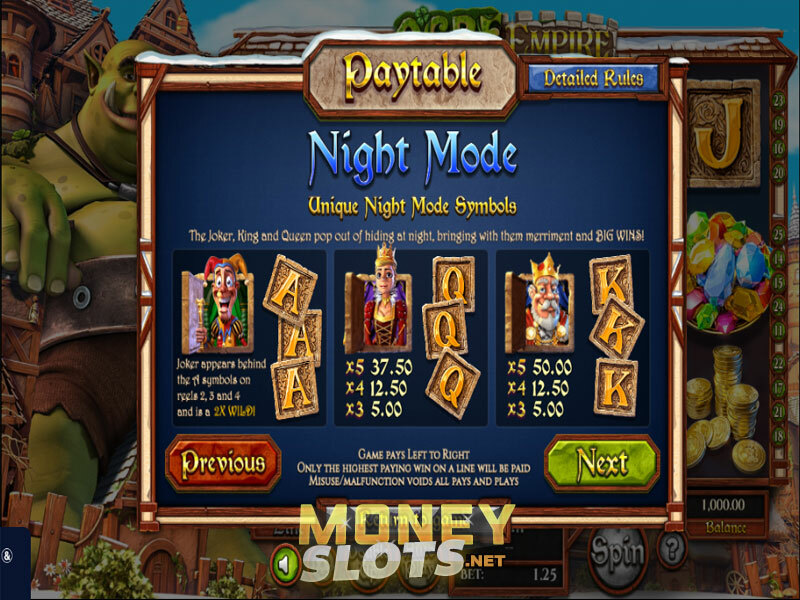 With the coin value that ranges from $0.01 to $1.00, bet up to 25 coins per spin and test your luck with the Ogre. The game offers 25 fixed paylines that award up to 200,000 coins. Ogre Empire pays from left to right after landing a minimum of three matching symbols. If the Ogre smashes the reels during the Day mode and removes all stone symbols, don’t worry because new symbols will fall into place providing you with fresh winning opportunities. To discover the realms of the Ogre’s empire, adjust the coin value, set your bet and spin the reels by hitting the Spin button. Put the Ogre to sleep and awaken the King, Queen and Joker by activating the Night mode. Joker is 2x Wild, so if it appears on all three reels, 2, 3 and 4, you will have your winnings multiplied 8x! Opt for the Autoplay and enjoy while the Day and Night modes shif. This kingdom offers more than one Wild. In addition to Joker Wild, both Day and Night offer special Wild Flower Blossom. Both Flower Blossoms turn up to three symbols into Wilds. The only difference is that the Sun one is doing that to nearby symbols and the Night Bloom can expand anywhere on the reels. Another fantastic feature is the Double Up game, which is available after every winning spin. Bet half or all of your winnings, in a simple game of Head or Tails and double your fortune. However, be warned, a wrong guess and you can lose everything. Ogre Empire is a game with superb interface and graphics, and you will be happy to read that you can play it on your desktop, laptop, tablet or smartphone. The magical tale of kingdom siege, mystical creatures and hidden treasures await you to join them.